This 280SL “Pagoda”, wearing its immaculately kept original paint and interior, has been exceptionally well taken care of from new and is fully sorted to the stature of top-of-the-line show quality example. With over $100,000 in restoration/preservation receipts from marque experts between 2010 and 2012, this incredibly original Mercedes is unusually proper and a serious candidate for concours showing and driving events. Matching Numbers. Chassis 11304412013101. Engine 13098312008049. 41,166 Miles. Original Paint 717 Papyrus White Exterior. 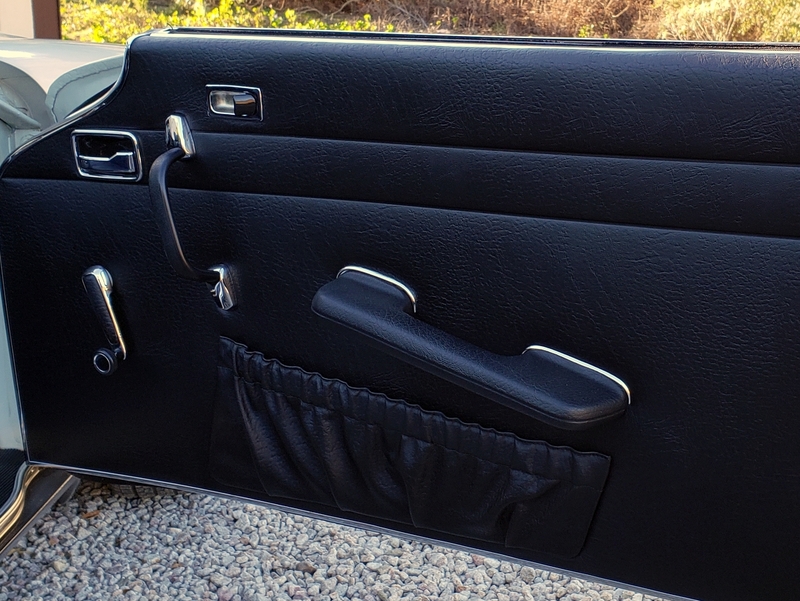 Original 131 Black MB-Tex Interior. Original Hard Top (White). Soft Top (Black). 2.9 Ltr M130 Engine. Well Documented Provenance, over 50 pages of maintenance receipts along with $116,000+ of recent restoration/preservation receipts. 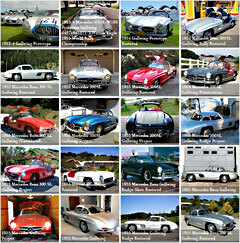 Photo documentation of restoration/preservation work done between 2010 – 2012 by marque expert Brian Peters of Motoring Investments San Diego. Frigiking Air Conditioning System. Original Books, Tools, Jack and Spare. 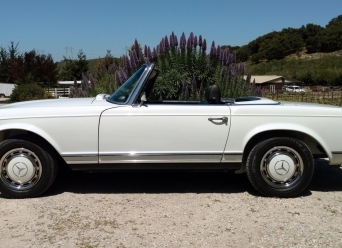 This exceptionally original 1970 280SL Mercedes “Pagoda” had 32,023 miles on the odometer in 1988 when it was purchased by the first owner of record, David and Elizabeth Cordes of Alton, Illinois. The Cordes’ would own the car for the next 11 years, driving it sparingly but regularly servicing it and never driving it in winter. In 2009, The Cordes’ sold it to the current owner through the St. Louis Car Museum with a documented original mileage of 38,887. Shortly after purchase by the current owner, the car was sent to Brian Peters of Motoring Investments in San Diego, California where an extensive, fully documented and thorough restoration/preservation was performed on the car. The current owner has since put less than 3,000 miles on the car with frequent servicing and proper storage. Under the current ownership (2009 – present), this unusually well kept original 280SL has been treated to an over the top and meticulously implemented preservation and restoration regimen. Over the course of 2 years and a painstaking attempt towards preserving and accentuating originality, the finished product can only be described as exceptional. In 2010, Brian Peters of Motoring Investments in San Diego, Ca was tasked with an “Ala carte” restoration of sorts, bringing all areas in need of attention up to show quality standards in an effort to compliment the incredibly well preserved original paint and interior. As is the case with many classics, the engine bay cosmetics, mechanicals and undercarriage of this Mercedes, while adequately good though worn due to age, did not match the eye catching quality and original perfection of the exterior and interior. The engine was removed from the engine bay and was completely disassembled, all mechanicals sorted and tested, all parts cleaned and replated correctly as original and finally, reassembled. While the engine was out, the engine bay, which while not in a bad condition did exhibit some wear, was sanded down and repainted in the correct 717 Papyrus white so that now the engine bay paint matches in quality the pristine nature of the original exterior. 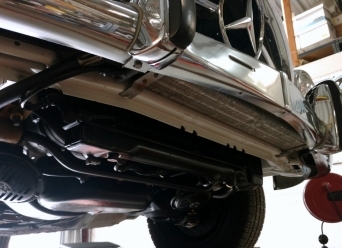 In addition to the above, the fuel system was completely overhauled along with the entire exhaust system being resurfaced along with the reworking of all electrical functions of the car for a perfect working order. All window seals throughout the car, including the hard top (which was completely disassembled and cleaned), have been replaced. All doors have been sorted to close perfectly with rubber replacements made where necessary for perfect precision as original fits. The front and rear suspension were completely taken apart, cleaned and resurfaced. Some refinishing was done on the undercarriage of the car as well, but much of the bottom surfaces were not in need of replacement or resurfacing, thus much of the underside was meticulously cleaned and left as original. Like the engine bay, the bottom of the car now matches the beauty of the exterior and interior for an overall classic Mercedes quality rarely seen on high level restored cars, let alone largely original ones. The work performed by Brian Peters at the behest of the current owner, which amounted to over $100,000 as detailed in receipts and process photos that accompany the car, left no stone unturned. Upon examination of the documented process this 280SL underwent, one notices immediately that this example sits a notch above nearly all other Pagodas. It is often said in restoration that the final 2% of work is what separates the great cars from the very best. 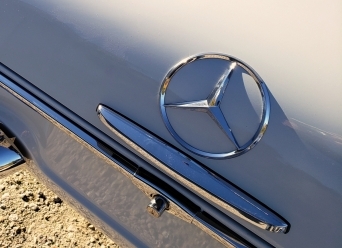 It is clear when looking at this Mercedes’ life and the care it has received that extraordinary lengths were gone to over the course of its life in order to achieve an incredibly well put together, largely pristine original finished product. Still retaining in exceptional condition its original 717 papyrus white paint and black MB Tex interior, this 280SL shows just 41,000 incredibly well cared for miles and is a preservation show car of the highest quality. You would be hard pressed to find another Pagoda with such well preserved brilliant original paint, very few cars in the world have remained as unblemished as this. The paint is patina’d with a subtle and originality defining “orange peel” texture characteristic of nearly all factory original condition classics which adds charm to the shine. The chrome is in wonderful condition matching in quality the nature of the still vibrant paint and speaks to the level of care the car has seen since it was purchased new in 1970. The interior of the car is as “like new” in its original condition as one could hope for, one of the best we have seen on a W113 Mercedes we’ve ever had on offer. The flawless nature of the seats, carpet and dash are a testament to lifelong care and it has befitted from being an MB Tex material interior example, the synthetic MB Tex blend lending itself to better wear resistance than leather. The wood along the top of the dash has been refinished to a high standard and “as new” during the comprehensive restoration and preservation. The steering wheel has been changed to a period correct Nardi wood wheel, though the car does come with its original steering wheel as well. For originality and attention to detail, one need look no further than this very special Mercedes 280SL. We have sold many exceptional original cars over the years and this one in the upper echelons of those we’ve admired the most. A truly special W113.